I am terribly excited for March 25. Why? Well I’m an awful spoilsport and the title of this blog post probably gave me away. But let me explain more. Promise to act surprised, okay? Launched by NAC Chef Michael Blackie in 2011, Celebrity Chefs of Canada is an exciting partnership between Ottawa’s talented local chefs and the national superstars changing Canada’s culinary landscape. 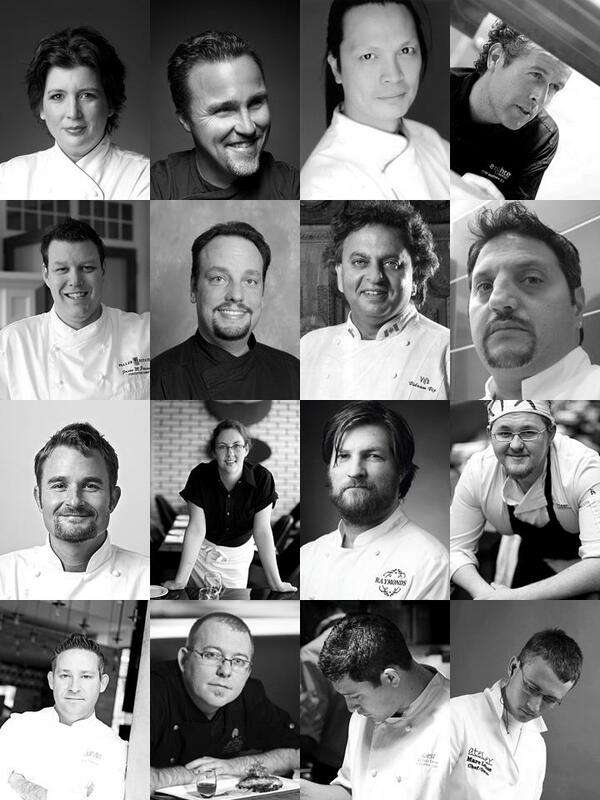 All of them will converge on the National Arts Centre stage on March 25 for an unforgettable gastronomic experience! Events like this normally elude budget-conscious students like myself, so I was particularly excited to be asked to write about it. Not only will I get to be in the presence of some of the most talented local and national chefs, but as a blogger I will get to hover about at their preparation stations as they prepare the day’s plates. I will not blink for an entire day for fear that I will miss a mere second of the culinary mastery. Here’s how it works for us bloggers: Each of us has been assigned a team, which is made up of one local and one national chef. So who is on my quote on quote “dream team?” Well, I am happy and incredibly excited to be covering Atelier owner and chef, Marc Lepine and Chef Quang Dang, the executive chef of West Restaurant in Vancouver. Just in case you dropped off the face of the earth last month, Chef Lepine is the newly minted champion of the Canadian Culinary Championships! A huge win and, to put it in technical food terms, pretty damn awesome. In anticipation of March 25’s event, I will be writing several blog posts over the next two weeks so you can better get to know both Chef Lepine and Chef Dang and find out what dish they’re preparing for your soon-to-be spoiled palettes. In the meantime, you can find out more about the Celebrity Chefs of Canada by visiting the information page on the National Arts Centre website, by following us on Twitter or by liking us on Facebook. Oh, and get your tickets before they sell out! Say hello if you see me – I’ll be the one looking overly excited near the front. I might also be drooling. Don’t judge, okay? Ottawa (Canada) –The National Arts Centre will feature Canada’s top culinary stars and some of Ottawa’s most popular chefs at the 2nd Annual Celebrity Chefs of Canada on March 25, 2012. Showcasing the newest culinary trends and best cuisine from Canadian chefs, the event will once again feature live cooking demonstrations, a food and wine tasting reception, and new this year, a chic after-party where guests can mingle with the chefs. Each national chef will collaborate with a local chef to create a one-of-a-kind dish during the live demos. Guests will sample these unique creations with wine pairings at the food and wine tasting reception. The NAC’s Panorama Room will be completely transformed into a hip lounge complete with DJ for the after-party. Participating local media personalities include Stuntman Stu and Angie Poirier from Majic 100, Sandy Sharkey from BOB FM as well as Kurt Stoodley and Leanne Cusack from CTV. 1. A “live demo + food & wine tasting reception package” in the NAC Studio and main foyer from noon to 7p.m. Cost: $135. 2. A “food & wine tasting reception + after-party with the chefs package” in the main foyer and Panorama Room from 6:30 p.m. to11p.m. Cost: $85. (Ticket price is exclusive of tax and gratuity). To learn more about the Celebrity Chefs of Canada click here. Proceeds from the event will go to support the NAC’s National Youth and Education Trust which furthers artistic education, training and mentorship for young Canadians. This event is made possible by presenting sponsor Garland Canada, Media Sponsor Bell Media, and hotel sponsor ARC The Hotel. Other event sponsors include C.A. Paradis, Testek Instruments Inc., Orleans Fresh Fruit, Summit, Chef Works Canada Inc., Premium Meats, Van Houtte , Dahlia Event Production, Mark Motors, Baldwin Audio-Visual and Algonquin College. Wine sponsors consist of Pelee Island, Peller Estates, Rosehill Run, Diamond Estates, Norman Hardie Wines, Spearhead Brewing Company, Lailey Vineyards and Stem Wine Group. Congrats Hilary! That sounds incredible!!! WOW that will be a great experience. Have fun!